Heading east towards Dallas’ central business district from Oak Cliff, an energetic splash of color catches the eye at the entrance of the Jefferson Boulevard viaduct. 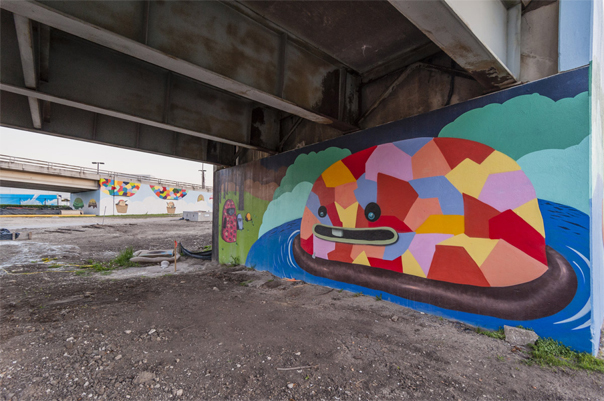 A recently completed mural, titled Dreamers, expressively counterbalances the adjacent Oak Cliff Founders Park. Significant renovations to this area are underway, including a completed designated bike lane and an extension to the trolley line, slated to run in early 2015. These improvements are part of Dallas’ initiative to promote fluid circulation and increased public interest across the Trinity River. 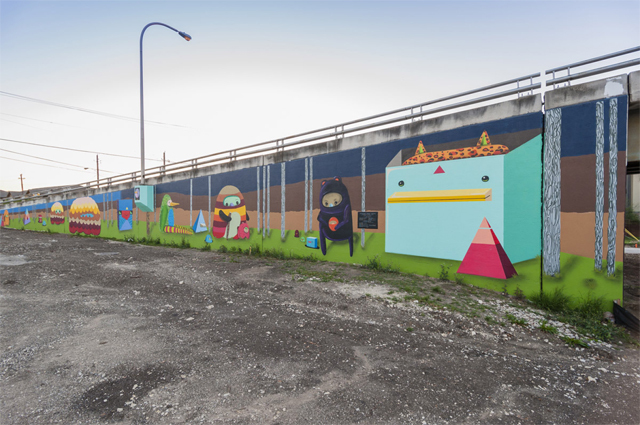 The mural is a collection of six unique surfaces, seamlessly painted to cover each of the viaduct’s two footings. 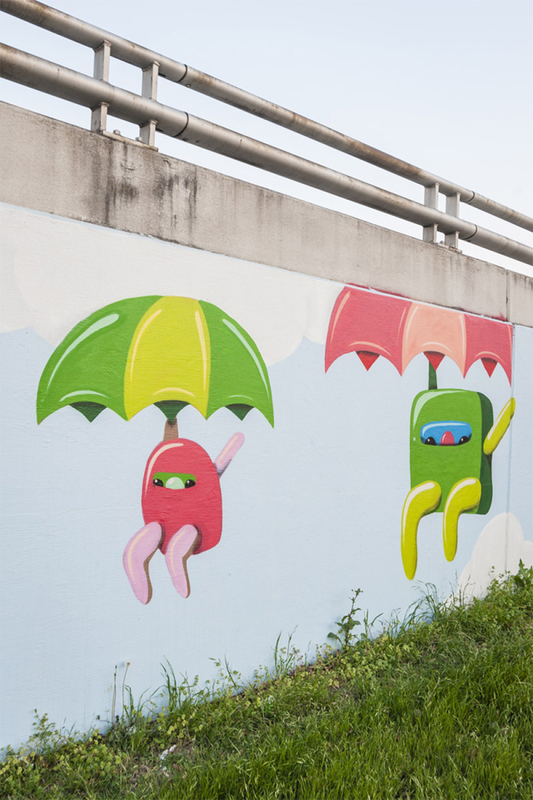 Completed by artists Carlos Donjuan and the Sour Grapes Art Collective, the mural follows themes of earth, sky, and water, imagined worlds inhabited by amusing fantastical characters. Earthy hues of beige and gold playfully converse with another segment of mural cloaked in a palette of blue and green pastels. At its heart, the work elicits a fresh approach to the methodology of transforming the ordinary into the extraordinary. In this instance a monotonous urban surface is renewed as an energizing and visually engaging space. Looking toward the city, the skyline appears nestled between the two supports of the viaduct, a painting on either side. 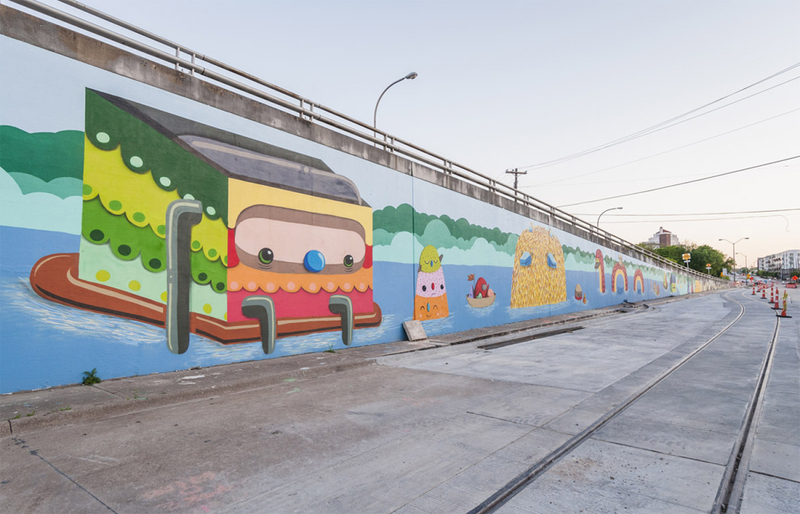 There, the city stands as a visual and theoretical link connecting the murals and the vibrant lifestyles of two sides of Dallas.